A season of art inspired by the world around us. We trace the pioneering experiments of two Pop Art masters and uncover some of the world's finest contemporary art and learn the stories behind some of the best contemporary portrait painting. 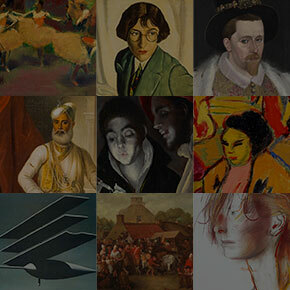 Browse our complete exhibition programme. Known primarily for her exuberant performances that feature multiple props, costumes and collaborators, Monster Chetwynd’s contribution here includes new and existing collages, paintings and performance videos. This exhibition re-examines some major Scottish figures, from Thomas Carlyle to Andrew Carnegie, raises questions about the nature of hero-worship and the values that were upheld by our Victorian forebears. Taking its theme from the much-quoted remark by Andy Warhol, this pair of artists shared a belief that art would become increasingly mechanised. This exhibition explores how they both, in parallel, discovered screenprinting and explored that idea of mechanisation. We have a whole host of new events especially designed for the smaller art fans of all ages - with ample opportunities to walk, talk, explore and play! With a particular focus on self-portraiture and representation, this exhibition celebrates the work of three of the twentieth century’s most influential photographers, and explores the connections and similarities between these three Americans, each of whom produced bodies of work that were revolutionary, ground-breaking and at times controversial. The Real Thing brings together works of Pop Art and Minimalism from the National Galleries of Scotland’s permanent collection. Highlights include works by David Hockney, Richard Hamilton and Eduardo Paolozzi, Roy Lichtenstein and Andy Warhol. Enter the minds of young people living in Scotland through their art, as they (and you) explore the mystery of being. This thought-provoking, interactive exhibition is a direct response to artworks from the National Galleries of Scotland collection. .
Join NOW artist Monster Chetwynd for the world premeire of this interactive performance inspired by works from our collection by Eduardo Paolozzi. Scotland's favourite avant-garde noisemakers' Neu! Reekie! bring us their unique take on I want to be a machine with poetry, music, animation, film, performance and realms beyond. Artist Sharon Quigley leads an introductory discussion looking at the ways contemporary artists incorporate collage and assemblage into their work. Join art historian, Dr Heather Carroll to discuss portraits of some of 18th-century Scotland’s most interesting and intriguing women. From Mary, Queen of Scots in ten objects to lifting the lid on the genius behind Dalí’s Lobster Telephone, our blog explores ideas big and small around the world of art. Alina Bzhezhinska (harp) and Magdalena Durant (soprano) perform a repertoire by celebrated Polish composers including Moniuszko, Karlowicz and Chopin, alongside iconic pieces by Britten and Burns. All families affected by Autism Spectrum Disorder are invited to explore the Portrait Gallery before the doors open to the public and take part in creative, sensory activities. Curator Blake Milteer provides an introduction to the recently acquired MacKinnon Collection of photographs and discusses its representation of Scottish life and identity from the 1840s through the 1940s. Edinburgh is truly special city and we have teamed up with friends across the city to showcase just what is great about it - the architecture, the history, the live music, the food and drink, the theatre, and of course, the art.